Another open-back on-ear design; the features are the same as the Grado SR125e headphones with regard to driver, cable and housing design. However, the Grado SR225e earphones also benefits from an increased rear air flow, utilises Grado's larger ear cushion and has closer matched drivers, within an astonishing 0.05dB. The improved metal rear screen increases air flow by 50%, freeing the headphone from colorations, whilst the use of closer matched drivers and the larger cushions results in an enlarged soundstage. The overall sonic improvement is unequivocal and the sound is, as always simply 'Grado'. 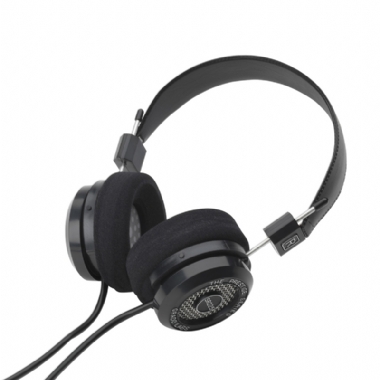 The SR225e is an open back on-ear headphone. The jack will fit into any modern day Hi-Fi system or music source, so that you can listen to music from any source you desire. The headphone is fitted with 3.5mm jack. A 6.33mm (1/4”) jack converter is included (fitted to the 3.5mm jack).